He has just won the Italian Championship for the second year in a row and he is ready to compete in Pamplona (Spain), from 22nd to 29th December; as it happened in Martina Franca and it will be for the upcoming Wijk Aan Zee “B” tourney, his sponsor for this event will be Italian chess magazine “Torre and Cavallo – Scacco!”, edited by Messaggerie Scacchistiche. 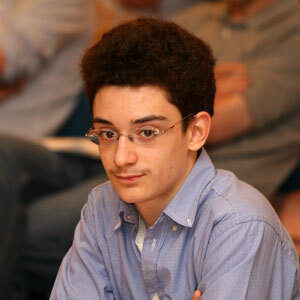 Fabiano Caruana, 16 years old and now more than a rising star of international chess, is training for the new tournament in the tranquility of his house near Budapest, Hungary. We asked him some questions about his performance at the Italian Championship and about his future and Fabiano, in spite of tough training, found the time to read them. His kind mother, Santina, reported us his answers by telephone. First of all congratulations for your achievement: you are Italian Champion for the second time. Are you satisfied with your outcome? No, not at all. I am not satisfied with my performance. I was very happy to be in Italy, naturally, but I didn’t play a good tournament. As it happened in Dresden, you didn’t gain full point with White against a lower rated opponent. In Dresden you got a draw with Kobese, while in Martina Franca you even lost to Valsecchi. Do you suffer loss of concentration when you face a theoretically weaker opponent? Or is there another explanation? I would rather not answer to this question because I don’t know either. “It is a very personal question”, adds his mother, “and he is still trying to figure out his way of playing”. What did you think and how did you react after you were defeated in round six and seven? I felt very sorry, but when you play in a tournament you have to keep on playing and do your best. You should keep concentrating and leave the analysis of your losses after the event. What was it like to face five players with whom you had just shared the Olympiad adventure? When I am in front of a chessboard, it doesn’t matter who I play with. I always try to do my best. Which is the best or most significant game you played in Martina Franca? 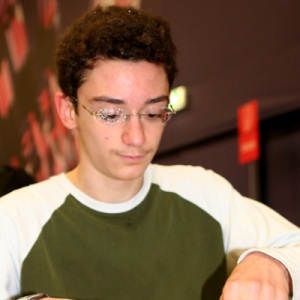 I think the game against Denis Rombaldoni was the best I played in the whole tournament. Before Martina Franca you played in Dresden and Cap D’adge, now you are awaited in Pamplona and then in Wijk Aan Zee. Don’t you think that so many close engagements can affect your performances? Aren’t you tired? Yes, I am tired and I am looking forward the break I have after Pamplona (two weeks). Then I will be able to rest and spend some time with my family. You are in the world top 100 now, you are famous both in Italy and in the United States and you are well known in the rest of the world, too. Do you think that your opponents has changed their attitude toward you, compared to when you were “just” a promising new talent? I can’t answer this question: you should ask that to my opponents! Which is your goal for the next two tournaments? Do you consider Pamplona a sort of training for Wijk aan Zee, where a win in Corus B will give you the chance to play against the top chess players in 2010? Both tournaments are important to me and I will try to do my best. Speaking about goals… Have you already set a deadline for you to become a top 10 player? And for the world title? At present, my goal is to improve my game quality. And we will see what will happen. Until the 31st of December you will be the best Under 16 chess player in the Fide list. If you where a champion of any other sports in the world, multinational companies would race to have you as a testimonial. We have noticed that in Dresden, while you were playing, there was always a bottle of Fanta near you. Fanta’s tagline is: “Play naturally”. Do you picture yourself advertising this famous soft drink in tv, as Korchnoi did with a Swiss milk a few years ago? I love Fanta, but I have never thought about advertising it! That sounds good… What do you think about it? If you can do something and help me find a sponsor, I will be happy to collaborate! We thank Fabiano and his family for the answers and wish him good luck for his coming up engagements! After making the first ceremonial move at the 1st board of the 3rd tournament of the FIDE Grand Prix in Elista Radjabov-Cheparinov, the Head of the Republic of Kalmykia, FIDE President Kirsan Ilyumzhinov gave a press conference. - Dear Mr. President, could you please inform us on the future of the FIDE Grand Prix series? As far as we know, despite the capital of Qatar, Doha, where from the 3rd tournament was moved to Elista, it is known that Montreux has also refused from organizing the 4th tournament. And it is likely that Karlovy Vary will also withdraw? - Last year we have implemented the FIDE Grand Prix series in order to structure the World Chess Championship cycle and to maximize the opportunity for attracting as more as possible the top chess players to the top tournament. The Swiss city Montreux could only guarantee 180 thousand euros instead of the necessary amount. That is why we have excluded it from the list of cities-organizers of the Grand Prix tournaments. The next tournament will most probably take place in Kiev. The municipality of Kiev sent an official letter, where they expressed their readiness and wish to organize this tournament. Soon, the inspection commission of FIDE will go to Kiev to check the facilities and I am sure the decision to hold the 4th FIDE Grand Prix tournament there will be made these days to come. The next, 5th tournament will be held in August 2009 in the capital of Armenia, Yerevan. At the World Chess Olympiad in Dresden, I met the President of Armenia, President of Armenian Chess Federation Mr. Serzh Sargssian and he expressed his readiness to host this tournament. He confirmed this personally also in writing. As you know, it was planned that in August 2009, Elista was going to host this stage of the Grand Prix. But since Doha has cancelled, we have the tournament in Elista now. And one city cannot organize two tournaments of Grand Prix. The 6th final tournament of this series was planned to be held in Karlovy Vary. So far, we have not received any official refusal from them. But even if we do, it is no problem for us at all, for we have received already two more proposals to host this stage. As for the capital of Qatar, it is most probably that Doha will host one of the tournaments of the next Grand Prix series. These series are already half the way towards completion: after Elista tournament, there will be only three left. I am happy to say that the FIDE Grand Prix series is going the right way. It was normally difficult to start the series, to open the way, but I do hope, in the future, all will be much easier. - Which principle was used when the withdrawn players were replaced by the new ones? Why was not the FIDE Ex World Champion Ruslan Ponomariov included into the list? - Ponomariov was indeed the first in the list of the reserve players. We have made an official proposal to him. The FIDE President assistant Berik Balgabaev and the Director of Global Chess Geoffrey Borg made some phone calls and talked to him several times. There were only two weeks left till the start of the tournament and Ponomariov could not participate at the last moment. The matter is that he will also not be able to participate in the 5th tournament of the Grand Prix in August next year. He has some other obligations to participate in August in Switzerland. Taking into account that in accordance with the Grand Prix regulations, each participant should participate in 4 tournaments out of 6, Ruslan has no sense to play in Elista tournament, for he would not even have played in 3 tournaments anyway. The next reserve player from the list was Vladimir Akopian. But he was already included into the list of participants as a nominee of one of the hosting cities of the Grand Prix 2008-2009. Therefore, the place was given to the next players in the reserve list: GM Pavel Eljanov and FIDE Ex World Champion Rustam Kasimzhanov. - As we also heard Michael Adams gave the following reason of his refusal to participate in the tournament in Elista: he is not happy with the prize fund. But he took part in one tournament in Baku. At that time, he liked the amount of the prize fund. Does it mean that the prize fund was decreased? - No, it is absolutely not right. The prize fund remained the same. As for the refused participants, in particular Adams and Carlsen, who withdrew their participation at their own free will , it is their own business. - Which rights will the winner of the FIDE Grand prix series 2008-2009 have? - He will have a right to play an official match against the winner of the FIDE World Cup 2009. And the winner of this match will meet the winner of the match Viswanathan Anand-Topalov/Kamsky to further fight for the World Chess Champion crown. Therefore, it is obvious that the Grand Prix participants have good motivation to play. In this cycle of tournaments, more than 20 top-rated Grandmasters have participated, and in the World Cup 128 chess players from many countries have a chance to fight to the title. - According to your statement, Mr. President, the Grand Prix winner will compete with the World Champion. It means that the previous conditions, declared before these series, are still valid? What about the decision of the FIDE General Assembly in Dresden, which states that instead of the match winner of Grand Prix vs. winner of World Cup, a Candidates tournament with 8 players will be held? Does it mean we misunderstood something? - The FIDE General Assembly in Dresden opened a bid to organize the Candidates tournament started the discussions if this tournament should be organized or not. But the final decision on this issue will be made at the FIDE Presidential Board, which will take place in March next year. Now, we are collecting the bids. Just to add, the World Champion Vishy Anand, the leading Grandmasters Levon Aronian and Magnus Carlslen are against the inclusion of the Candidates tournament in the cycle. Proposing to organize this tournament, we proceed from the fact that the losers of the World Chess Championship matches would still have an opportunity to fight further for the World crown, and will not be out of the boat at all. Besides, it is planned that the loser of the semifinal match Kamsky-Topalov, two finalists of the World Cup and four Grandmasters with the highest rating will be also included into the 8 players Candidates. This tournament will gather the best chess players of the planet. This system is good from many sites and pursues many good objects: first of all, the tournament of the best chess players of the planet will attract the overall attention; it will also work for the popularization of chess in the world. Secondly, it will have a big sports meaning for the participants themselves and will be a great financial help for them: the prize fund of the tournament will be not less than one million US dollars. And third of all it is really profitable for FIDE: 20% of the money will be transferred to the World Chess Federation. And they will be used for development and popularization in the world.